If you love macaroons, do I ever have a treat for you today! I'm using this pretty Royal Albert March trio that my friend, Colleen, gave me from her collection. I've tried to complement the pretty set with some purple-hued flowers. This darling glass, birdie-topped bottle was given to me from my friend, Joy. Isn't it sweet? I decided to fill it with milk for my tea, but it could be used for salad dressing, syrup, etc. The Royal Albert March set is named Anemone. It's so pretty for Spring! After I ate some of these, I tried dipping the bottoms of the cookies in leftover melted chocolate that I had saved from my Peanut Butter Easter Eggs. The chocolate was a winner! Please help yourself to a macaroon or two, while I heat up the electric kettle for some more tea. Oh my goodness, if you love coconut, please do give these little morsels a try. I found the recipe on Allrecipes.com, but added some almond extract to enhance the flavor. Also, dipping the bottom of the macaroons in melted chocolate, is an added ambrosial flavor. Preheat oven to 350 degrees. Line cookie sheets with parchment paper or aluminum foil. In a large bowl, stir together the flour, coconut and salt. Stir in the sweetened condensed milk and vanilla and almond extracts, and using your hands, or a wooden spoon, mix until well blended. Use an ice cream scoop to drop dough onto the prepared cookie sheets. Cookies should be about golf ball size. Bake for 12 to 15 minutes ( mine took about 18 minutes) in the preheated oven, until coconut is toasted. Cool on wire racks, and if desired, dip the bottoms of the macaroons in melted chocolate. Makes 2-3 dozen depending on size. Kitty, those macaroons are a MUST try now. They look so good. And you know I love Royal Albert, any design. I also think that little bottle with the birdie on top is just adorable. Love it! Oh Kitty...yummy! I have never tried to make macaroons, but I love them. Hope you had a lovely Easter. Your table is delightful, as always. Lovely post! I love Royal Albert and trio sets! Your trio is just so pretty, Kitty! What a lovely gift from your friend and that little birdie topped bottle is adorable! The green gingham is so perky underneath it all. I haven't made macaroons in forever. I will have to make them again soon as I love them and yes, the chocolate makes them even more yummy. I hope you had a lovely Easter and thank you for sharing with us. Enjoy your new week. One of my favorite cookies, ever. Yours look yummy and sound splendid with chocolate! Mmmm! Such a pretty setting with the lime gingham table topper. The macaroons look so yummy. I haven't made them in a couple years, maybe this post will get me into the mood to bake some sweets. Macaroons are so good. I like them better than maccarons! Hope you had a lovely Easter. Kitty, you always post the BEST recipes! Have a beautiful week! lovely bottle and such a pretty tea set! Thank you for the sweet macaroons! Stopping by from the BTTCG! A delightful tea trio with your treat of macaroons. I'm not big on coconut but I'm sure my hubby would dig into these, especially with some chocolate on the bottom. Hope your Easter went well with the family. Kitty your setting for tea is lovely. I love that little chicken wire bird house, I've never seen one before, too cute! The macaroons look yummy and thanks for the recipe. 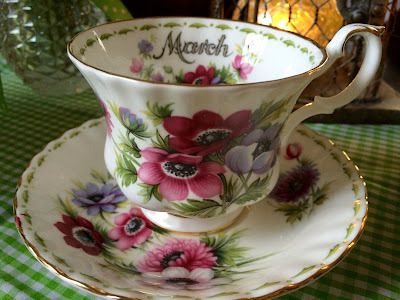 Adorable March RA teacup, I only own my month's one, October... of course, wish I had one for each month of the year. Have a great week my friend. Kitty, I love your little bird bottle. So sweet. And the macaroons! Another recipe that I want to try. Yum! How thoughtful of your friend to gift you her RA March trio set from her collection. I've always been a fan of coconut and chocolate so your coconut macaroons dipped in chocolate sound heavenly to me! Thank you for another great recipe. I have printed out so many of your recipes over the years and they are always lovely, I had to smile at the bottle with the bird as I used to sell those. I think your ideas for it are great. Thanks so much for sharing and linking your sweet post. Kitty, I can only imagine how wonderful your macaroons are with the addition of almond extract and dipped in chocolate! I love your sweet Royal Albert March tea cup and saucer too. Do you display all your pretty tea cups on a hutch or in a china cabinet where you can enjoy them? I'm on the hunt for some pretty teacups so I can do some posts with each of my teapots. None of mine coordinate with the cups that I have already. However I won't be able to show mine with all the delicious goodies you create!! Do you know I've never had a homemade coconut macaroon. Not one ever. These look yummy. Dearest Kitty - oh I loooooove coconut macaroons, and I have never made them. Sometimes a local specialty store sells them and I always buy a batch or two. Thanks so much for the idea and recipe - and the idea of dipping bottoms in chocolate - oh yum, how is that a bad plan????? Your lovely birthday tea set was a very thoughtful gift. What a sweet friend. These look wonderful! Dipping in chocolate probably puts them over the top delicious! I do love coconut. I made a coconut cake for Easter. Will have to try these soon as I have an extra bag of coconut left and now I know just what to do with it. Hopig you had a lovely Easter weekend. Yes, dip mine in chocolate please! What a pretty spring tea time. I love your pretty table you set and the macaroons look so good and yummy! Thanks always for sharing your wonderful recipes with us each week at Cooking and Crafting with J & J. We love having you. Enjoy the week. Such a lovely March tea cup and your table setting is gorgeous.. I have never made a macaroon, and my husband loves coconut. I am a very negligent wife! I love the idea of dipping them in chocolate too. This March tea cup is exquisite. Thank you so very much for joining us today at Thoughts Of Home On Thursday! Almond extract makes everything taste like a dream Kitty, your macaroons are a work of art! Kitty, that *was* a treat! I love that trio and the whole setting. Macaroons and a cup of tea (love the milk bottle, too) ... aaah. Oh my! They look marvelous and I do love them. Somehow I've always felt that they must be difficult to make Hmmmm...perhaps not! I love macaroons. I love coconut. My kind of treat. Oh my who wouldn't just love your Coconut Macaroons, they look heavenly. Your tea tables are always very special, thanks so much for sharing it with us at Full Plate Thursday! Hop you are enjoying this lovely Spring weather we are having. 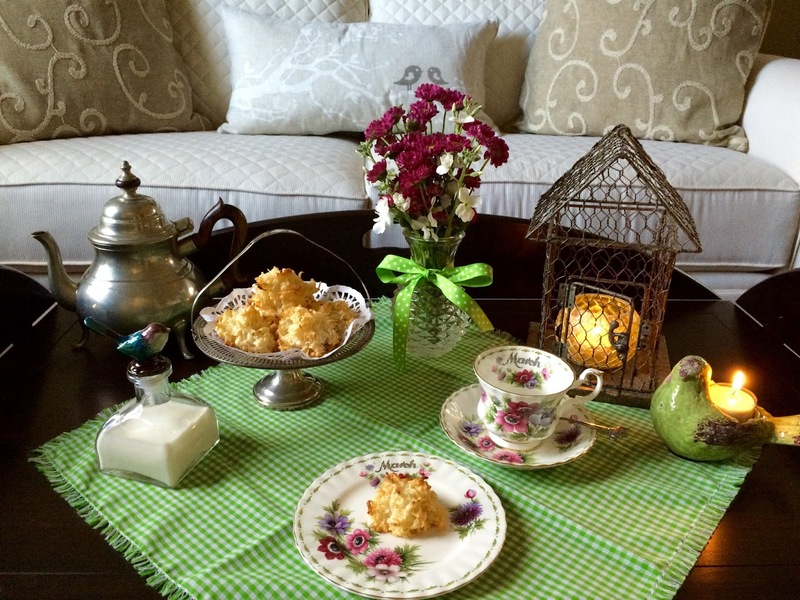 You've created a very cozy vignette and the macaroons are the perfect treat for the tea! You've set such a PRETTY tea table, Kitty. The Royal Albert "Anemone" is absolutely gorgeous -- I love it!! Those macaroons look and sound delicious, and I'm definitely pinning this one. :) Thank you for sharing and have a lovely week.